It’s no secret that Katruska and I have had a torrid love affair with bourbons, ryes, scotches…well, most whiskeys, for a while now. However, bourbon seems to hold a special place in our hearts. We love them neat, in Manhattans, in Old Fashioneds, and, of course, in juleps. Especially in juleps. It all started almost a year ago when we tried an orange-basil julep at The Shed at Glenwood. It was so delicious that we began trying all sorts of variations in our lab. So, when the lovely Mandy Sewell (aka @ladyduplex) won the random drawing of our Facebook fans, I hoped she would be game for a julep in her honor. Fortunately, through several email chats I discovered she was beginning to get into bourbons, loved southern foods, and has started an herb garden. Based on that we created a pear-sage julep dubbed the “Mandy at the Races”. Mandy’s julep is inspired by all the juleps we’ve tried and our thoughts of a warm spring day before that very genteel Southern activity of horse racing. You’ll find it has a sweetness from the pear that balances well with the oak of the bourbon and the herbaceousness of the the sage. We are very excited about this creation and we hope that Mandy will spend many pleasant evenings raiding her herb garden and sharing “Mandy at the Races” with friends. Slainte! Put pear and sage in cocktail shaker and muddle. Add bourbon, sage simple syrup, pear liqueur, and crushed ice. Shake or stir until very cold. 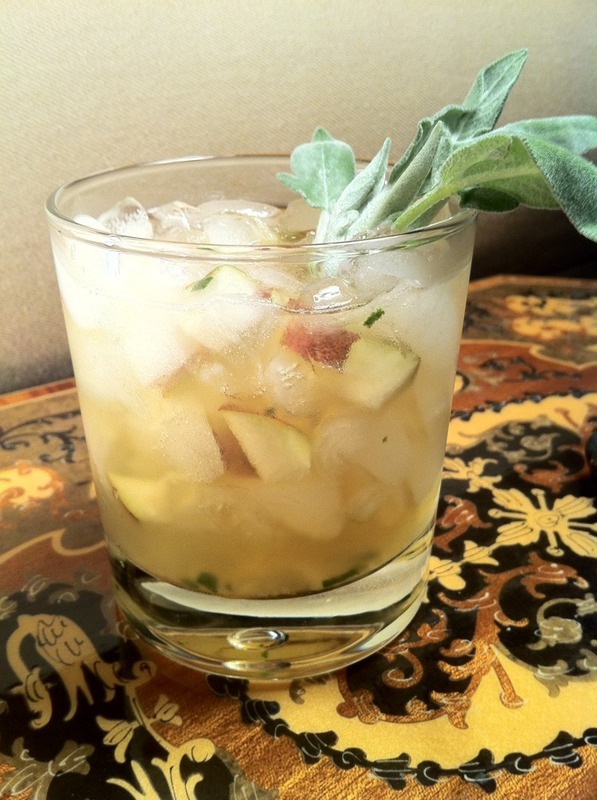 Pour all ingredients into a rocks glass, top off with soda water, and garnish with sage leaves if desired.